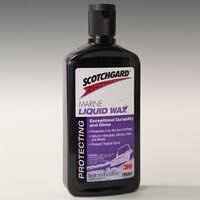 Scotchguard Marine Liquid Wax is formulated to provide an exceptionally high gloss with durability that lasts. Use on fiberglass/gelcoat, marine topside paints, painted aluminum, and marine metal parts. Formula uses reactive chemistry which actually bonds to your boat's surface to provide lasting protection.